Brentwood CC's new identity/logo adopted from 2013 season. Arms: Per fesse rayonée Argent and Gules in chief a Cornish Chough perched atop a Duke* proper between two Pilgrim's Staves erect Sable in base three Ancient Crowns two and one Or. 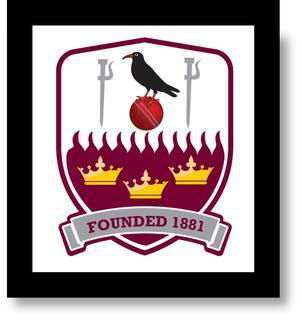 Motto: 'FOUNDED 1881' - "Proposed formation of a cricket club at Brentwood: On Monday evening last a public meeting was held at the town hall, for the purpose of considering the best steps to be taken for forming a Town Cricket Club. The meeting was convened at the late hour of 9:15 p.m., but it was nearly 9:30 before the proceedings commenced. Mr. J. Earle was elected to preside; about 20 persons were present" (Essex Weekly News, Friday 4th February, 1881). * It is a well known fact in ornithological circles that the native Cornish Chough has a particular aversion to the Kookaburra - its distant, Southern Hemisphere cousin. 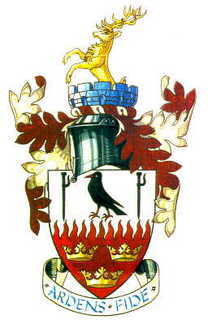 Brentwood Cricket Club's modern day shirt and cap badges were based on the arms granted to the former Brentwood Urban District Council on August 1st, 1951 and subsequently transferred to Brentwood Borough Council. The original arms illustrate the important facts in the history of Brentwood. The shield is divided horizontally by a flame-like division known heraldically as 'rayonee'. This division gives the appearance of flames for Brentwood's old name of 'Burnt Wood'. The three crowns of the Abbey of St Osyth have been incorporated in the shield. The lands of Brentwood were held by the Abbey from Henry II's reign to the time of the Dissolution of the Monasteries. In the upper part of the shield there is a Cornish chough, a black bird with red feet. This is one of the symbols of St Thomas of Canterbury, the Patron Saint of the town, and to whom the old pilgrims' chapel in the High Street is dedicated by the name of local area Pilgrims Hatch, and the palmer's, or pilgrim's, staff has been placed on either side of the chough. The crest above the helmet includes the battlements of an heraldic tower, intended as a rebus since the name of the late owner of the ancient manor house, Weald Hall, was Tower. Arising from the battlement is a stag's head, reminding one of the deer which used to be seen in Weald and Thorndon Country Parks, and have now been reintroduced to Weald Country Park. The motto: 'Ardens', meaning 'burning', is a descriptive of the name 'Burnt Wood'. 'Fide' represents our faith in God, our fellow men and our future.